Ex-cop and private investigator Lynn Bryant finds her life in danger as she investigates the murder of troubled psychic Karen Shaw, uncovering a web of death and destruction involving Karen's artist boyfriend Johnny; the abusive home life of a teenage girl; and the girl's lying, womanizing father. Lynn's former Houston P.D. boss and current boyfriend, Frank, advises stepping back. But Lynn's bound for Karen's high desert hometown, and discoveries about Karen's life that surprisingly and intimately affect her own. 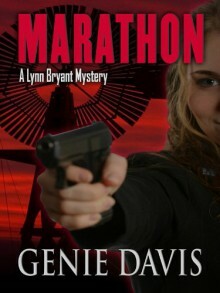 Marathon is a page-turning, high-powered mystery thriller that moves from the high rises of Houston to the desert ranches of Big Bend Country, exposing the terrifying consequences of love, death, and family ties so twisted it takes all of Lynn's investigative skills to unravel them.